Is there any tips to learn how to post with enough constant frequency? So far I can just dream about it ;o) But I have excuse – I was totally hooked and worked on my newest Imagical Garden™ collection. MANY thanks to Novi for such lovely name suggestion!! So, 10 hats, backpack, flower pins – just to name what already finished. I am so excited about this collection, especially hats!! Not each hat designed in different style, but also features at least two options for totally changing-look. Plus some “secrets” and tips even advanced crocheter may find helpful and innovative: how to make a perfect brim in any shape and sizes, how to make one-size hat to fit several sizes, how to make visor “standing” without insert even if crochet with lace weight yarn and much-much more!! I like the hat that laces up the back. It’s so Easter hat-ish. The ladybug is so adorable!! I love them all , you are amazing ! The white and green. All three are beautiful. 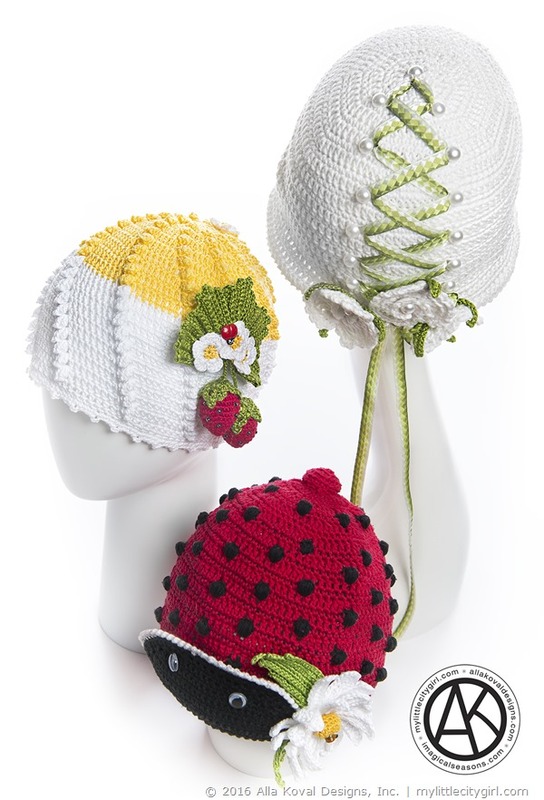 I want to make all three hats!!! But I would start with the ladybug. Thank you so much ladies!! The Ladybug pattern is almost done and we did modeling last week, yay! !